A solar hand pump is a water pumping device that utilizes solar energy to draw and pump water from a bore well during the day and offers an option to store water in an overhead tank, for use when solar energy is not available. It is an eco-friendly and sustainable use of technology without any impairment to the environment. Since it only requires solar power for operation, it proves to be more cost-effective than the pumps that use electricity. 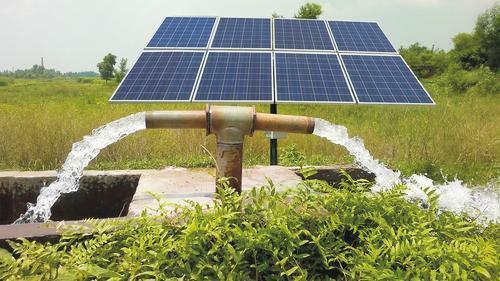 The solar-powered submersible pump can be installed on a bore well and operates on the electricity generated by the solar array. Batteries are not required for power storage. 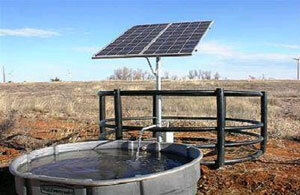 The submersible pump directly stores water in an overhead tank, for use in the absence of power from the solar array. The set up is convenient and simple, which entails no operational costs, while the cost of maintenance is also relatively low. The pump head is made up of stainless steel and the body is lightweight. The size of the operating head can be chosen from 15m to 90m as per requirement. The pump discharges water ranging from 500 to 4500 liters per hour. The pump can be installed in bore/tube wells of 100mm and above diameter and requires a brushless DC or a specially designed AC motor for operation. The voltage requirement of the motor ranges from 30 to300 volts, depending on the quantity of water drawn. The optimum rate speed of the pump is 500rpm and can reach a maximum of 3600rpm. Monocrystalline or multi-crystalline photovoltaic cells are fitted into an aluminum frame to create the solar array. A galvanized piping structure is used for mounting the solar array, which makes it corrosion resistant. The solar panel can also be tilted in any suitable direction for the optimum utilization of the panel. 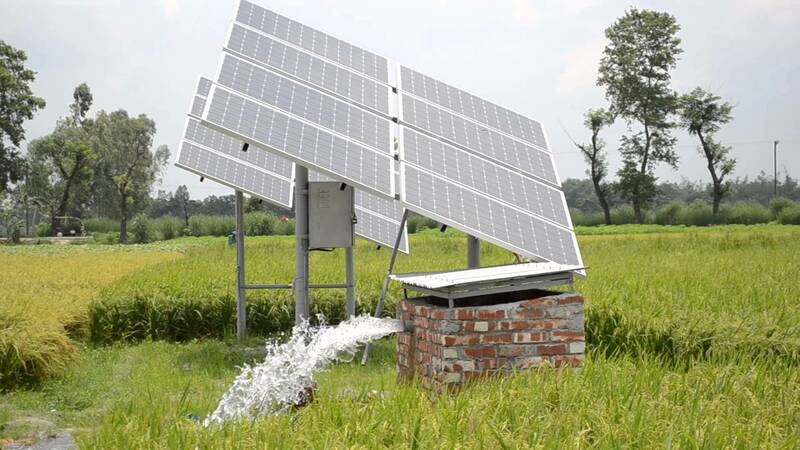 A power output of the panel ranges from 500-2000 watts at 15 to 100 volts, and the operating temperature ranges from 40 to 80 degree Celsius.A deep well hand pump can also be installed on the same bore, using riser pipes, as a backup, for assurance against lack of solar power. The solar hand pumps manufactured at Aakash International use the best quality raw materials acquired from trusted vendors of the industry. Also, strict quality control measures and adherence to industry standards are followed to ensure that only the superlative quality reaches the customers. The products are designed keeping in mind the varied needs of customers and a wide range of globally sought-after products developed using high-end technology and, can be procured at modest and affordable prices.